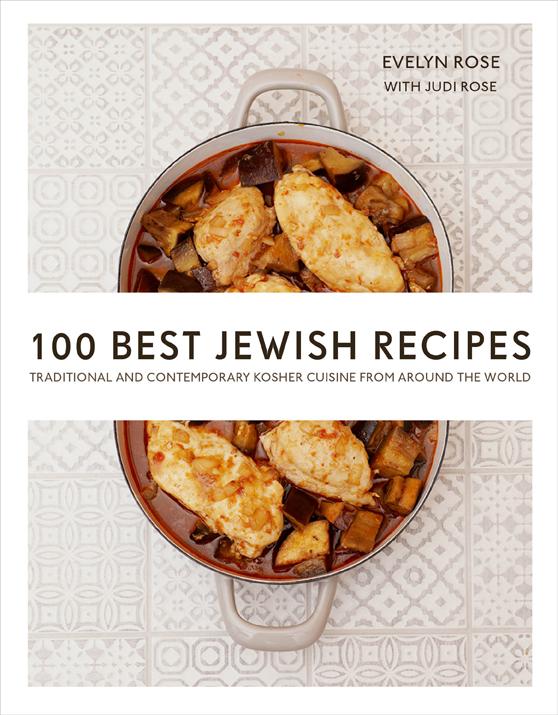 100 Best Jewish Recipes: Traditional and Contemporary Kosher Cuisine from Around the World is a compilation by Judi Rose of her mother’s (Evelyn Rose) favorite and most-loved classic dishes from the diverse and adaptive Jewish cuisine. The reader is taken on a culinary journey from Jewish communities around the world with recipes from Hungary, Austria, Germany, the United Kingdom, Israel, Greece, Indonesia, the Netherlands, Lithuania, Italy, Iran, Turkey, Denmark, Armenia, Spain, Russia, Syria, Egypt, and other regions in the Middle East, Mediterranean, and Europe. British food writer Evelyn Rose was the authority on Jewish cuisine as the food editor of the UK’s oldest Jewish newsletter, the Jewish Chronicle, for over thirty years and author of The New Complete International Jewish Cookbook. She was awarded an MBE in 1989 and was an Honorary Life Fellow of the Institute of Home Economics. She died in May 2003. Her daughter, Judi, cooked alongside her for over 30 years and they created two cookbooks together, including Mother and Daughter Jewish Cooking in 2000. Judi lives in London and New York and is also a food writer, consultant, and culinary expert. Chapters are divided based on course: Introduction; Festivals and Food; Small Plates; Soups; Poultry; Meat; Fish; Vegetables and Side Dishes; Bread, Bakes, and Desserts; Basics; and Adapting Recipes for the Kosher Kitchen. The book begins with an introduction to Jewish cooking, its dietary laws, and influences from other cultures. There is even a guide for adapting other recipes for the kosher kitchen such as substituting butter and dairy products, chicken stock, and shellfish. A list of Jewish festivals (Rosh Hashanah, Yom Kippur, Sukkot, Simchat Torah, Chanukkah, Purim, Pesach, and Shavuot) and what foods are prepared for each is also included. For those who celebrate Passover (Pesach) starting next week, Rose recommends the following recipes from the book for Seder- the ceremonial meal: Katsis Kishuim (Israeli Courgette Pate), Chatzilim (Poor Man’s Caviar), Chicken Liver Pate, Cocktail Fish Balls, Avocado and Egg Pate, Traditional Chicken Soup, Courgette and Lettuce Soup, Chicken, Mushroom and Courgette Soup, Borscht on the Rocks, Soup au Cresson, Braised Brisket Pot Roast, Florentine Beef Stew with Red Wine and Rosemary, Greek Jewish Lamb Fricasee, “Fried Fish”, Gefilte Fish Provencale, Salmon under a Pecan Crust, Heimische Casseroled Hen, Oven-crisp potatoes, Crispy Sauteed Potatoes, Sauteed Sweet Peppers, Fritada De Espinacha (Sephardi Spinach and Mushroom Bake), Badinjan Kiku (Pergian Eggplant Frittata), Imam Bayaldi (Egyptian-Jewish Stuffed Eggplant, Cinnamon Balls, Almond Macaroons, and Mirkatan (Armenian Fruit and Nut Compote). Judi has also included a few recipes that can be used for Seder with a few adaptations: subsitute lemon juice for vinegar in the Israeli Salad, use potato starch instead of cornstarch for the Dutch Meatballs in Egg and Lemon Sauce, potato starch in place of cornstarch and serve without the optional dumplings for Tsimmes, omit mustard and use matzah meal not oatmeal for the Gefilte Paprika (Stuffed Peppers), and use potato starch in place of cornstarch for the Roast Chicken with Pine Nuts. Measurements are provided in US Customary and Metric. Most of the recipes includes a headnote with background information and serving guides. The name is listed in the original language and English where applicable. Storing and making ahead information are also given with how many portions the dish makes. I personally appreciated knowing whether the meal could be made in advance or frozen and for how long. Photography is provided by Clare Winfield. Many of the recipes include a beautifully-styled full page color photo of the finished dish. This book is great for home cooks, beginner to more experienced, interested in Jewish cuisine and culture. The recipes are well-written and incredibly accurate. This is the first cookbook I have come across that actually states how many grinds of pepper to add. 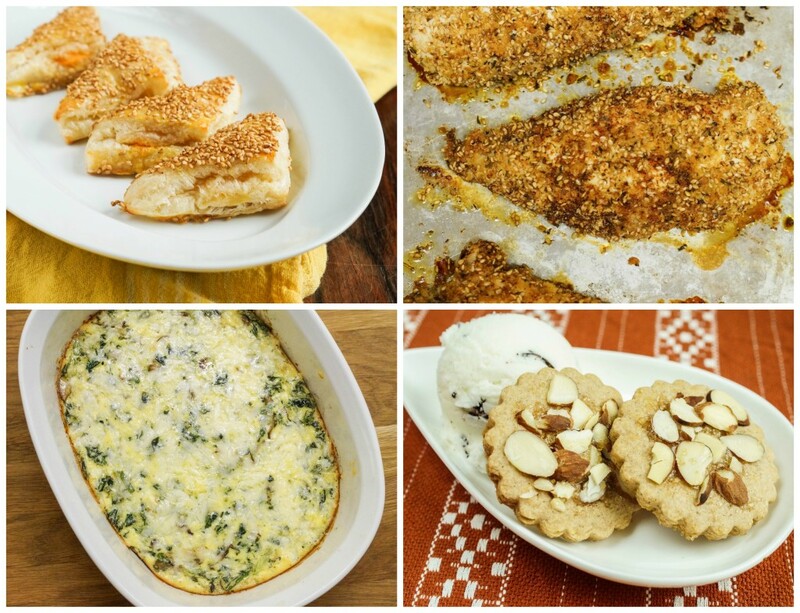 Recipes range from weekday dinners to those made to impress for special occasions. Most of the ingredients can easily be found in the average American grocery store. Some of the more difficult to find products include dark soy sauce, pitted Morello cherries in syrup (Trader Joe’s), and smetana (can substitute with sour cream). 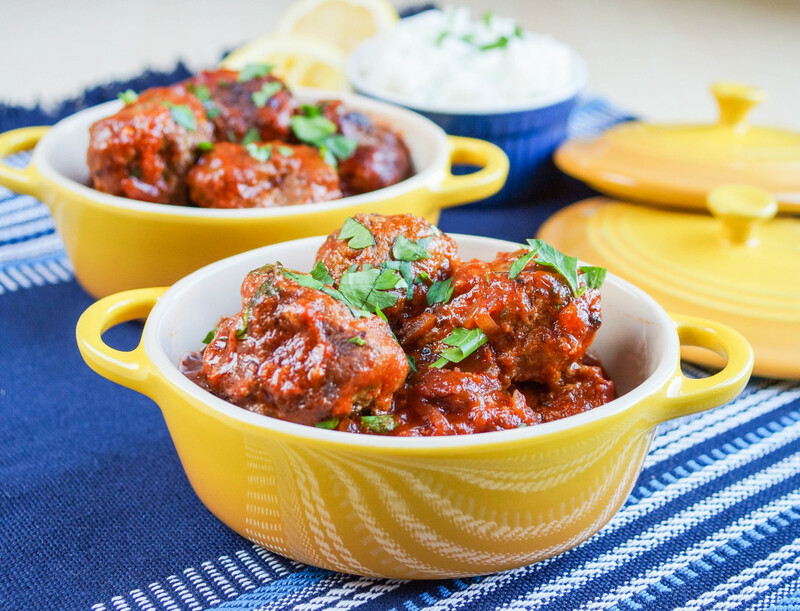 Albondigas al Buyor are Greek-Jewish meatballs simmered in a sweet and sour tomato sauce. 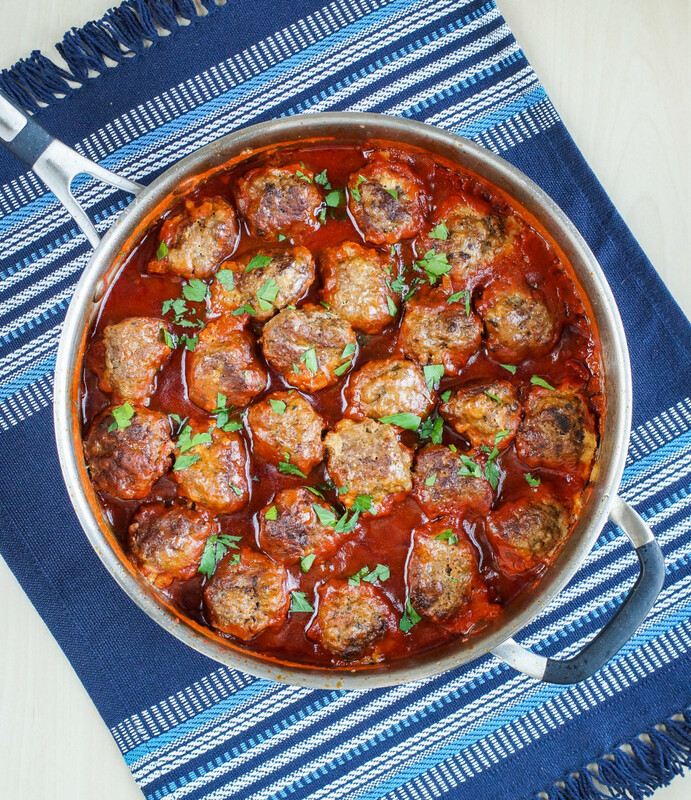 When Sephardi Jews were expelled from the Iberian Peninsula, they brought Spanish influences with them to Greece, including spices and the name for these meatballs- Albondigas in Judeo-Spanish/Ladino. 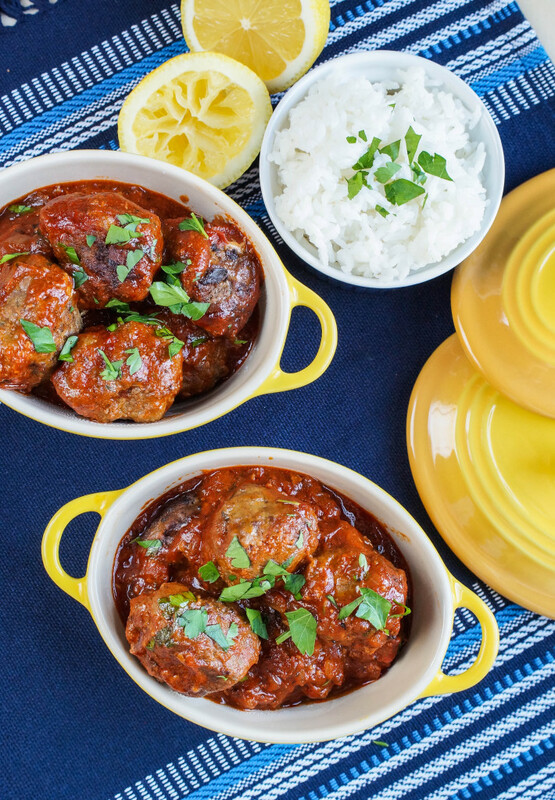 The beef-based meatballs are seasoned with bread, onion, dark soy sauce, and parsley. They are simmered in a sweetened tomato sauce with lemon, soy sauce, and mustard until tender. I added a little chopped parsley on top for color and served the Albondigas with steamed white rice. Keep a bowl of cold water near your work station when forming the meatballs. Wet hands will keep the meat from sticking. Dark Soy Sauce is also known as sweet soy sauce, black soy sauce, or thick soy sauce. It is available at many Asian Food Markets or on Amazon:Pearl River Bridge Superior Dark Soy Sauce, 16.9-Ounce Glass Bottles (Pack of 2) and Koon Chun Black Soy Sauce . In a pinch, you can also make your own substitute. In a small microwavable bowl, mix together 1 tablespoon water, 1 tablespoon soy sauce, and 3 tablespoons brown sugar. Microwave for about 20 seconds and stir to combine. This makes 1/4 cup of a thinner dark soy sauce. I also made Syrian Cheese Puffs, Oven-Fried Chicken, Fritada de Espinaca (Sephardi Spinach and Mushroom Bake), and Judebrod (Danish Cardamom Cookies). Syrian Cheese Puffs, also known as savory Sephardi cheesecakes, are an easy, but delicious appetizer with only 5 ingredients. Squares or circles of puff pastry are filled with shredded cheddar cheese, folded to seal, topped with sesame seeds, and baked until golden. I appreciated the tip of freezing the cheese before grating in the food processor to keep it from gumming up the blade. That will definitely come in handy next time I make a large batch of macaroni and cheese. Of course, this was my son’s pick. Chad was a fan of the Oven-Fried Chicken. The recipe is made for 6 chicken breasts, so I sliced and froze the extras to toss with salads for easy lunches. The chicken in seasoned breadcrumbs (matzo meal) and baked until cooked through. I added sesame seeds for the sesame chicken variation. The Fritada de Espinaca is a baked omelet filled with spinach, scallions, cheese, and mushrooms. It was easy to prepare and I particularly liked the creaminess and flavor from the herbed cream cheese. This one was my daughter’s favorite. Judebrod are Danish cardamom cookies topped with sanding sugar and sliced almonds. They are delicious with ice cream or a compote of summer fruits. I shared them for a get-together and they were a huge hit. To make the meatballs: In a large food processor, pulse together the eggs, bread, onion, salt, pepper, soy sauce, and parsley until smooth. Scrap into a bowl and mix in the beef by hand just until combined. Set aside for 30 minutes. Spread the flour on a plate. Using wet hands, shape the meat into medium-sized balls or patties and lightly roll in the flour, shaking off the excess. Arrange in a single layer. Drizzle oil in a large pan over medium heat. Once thoroughly heated, add the meatballs, in batches if needed to not overcrowd. Cook until browned on all sides. Use a slotted spoon to drain the excess oil from the meatball and transfer to a plate. To make the sauce: In the same pan used to brown the meatballs, add the finely chopped onion and cook, stirring occasionally, until softened and golden. Mix in the salt, pepper, brown sugar, mustard, soy sauce, lemon juice, and tomato paste with water. Bring to a simmer and cook for 5 minutes. Add the meatballs in a single layer, cover, and simmer for 30 minutes. The sauce and meatballs can also be transferred to a casserole dish or Dutch oven and baked at 300 degrees F (150 C) for 45 minutes. Serve hot. They will keep in the refrigerator for up to 4 days and in the freezer for 3 months. These sound so flavorful! I want to learn more about kosher cooking, too.